I'm a very impatient person, but on this trip to Minneapolis patience and forbearance paid off in spades. That said, St. Paul-based Izzy's Ice Cream was harder to get into than SPQR at 7:00 on a Friday. Our first attempt was via the web on Saturday morning. Since we were crossing the grand Mississippi to pay a virgin visit to the St. Paul Farmer's Market, we thought we'd drop by for a frozen scoop or two before lunch. The website put Izzy's opening hours at 2:00pm, which rather late for what is still essentially summer, but we decided to swing by anyway. Maybe the website was wrong. We got Izzy's, which was clearly closed, and looked at the hours painted on the glass door. They stated they opened at 12:00pm. It was 11:00am. Without anything left to do in the capital city, we went back to Minneapolis to lunch at Bryant Lake Bowl. (This was a happy side trip because we had our first taste of Surly beer, but more on that later.) At 12:30 we headed back across the river. Izzy's was still not open. This time we found a red sign stating that their "fall" opening hours (valid only for September and October because true Minnesotans know that November is not fall but winter) was 2:00 pm. Lord. Frustrated and yearning for the elusive salted caramel I had sampled over a year ago, we trudged to Kowalski's on Lake Street. 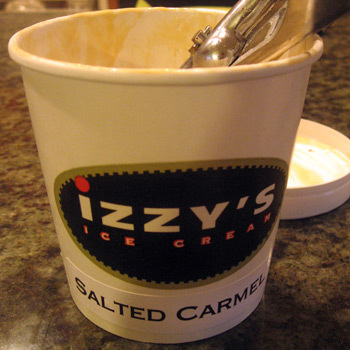 We knew they carried Izzy's but sadly, not one pint of salted caramel could be found. I didn't want to be mad at Izzy's -- after all, they were (by their calculations) the first shop in the nation to be run by solar power! Also, I really wanted to get my husband in on that salted caramel because the lines at Bi-Rite have been Bi-Ridiculous. Our third and final attempt on Monday afternoon actually got us in the open door, but as we scanned the list of ice creams, we saw no Salted Caramel. We looked in the pint freezer. No salted caramel. We sighed sadly and made other delicious choices -- sampling an incredible pink grapefruit sorbet before settling on seasonal pumpkin and coffee -- but when I mentioned to the girl helping me that I had been hoping for the mythical salted caramel, she said, "We're making it right now. We'll have it tomorrow." I said, "Oh, I'm leaving town tomorrow..." She said, "We'll have it for you when you get back." "No, I live in San Francisco," I mourned. "Hang on," she said. She went next door -- TO WHERE THEY WERE MAKING THE ICE CREAM -- and came pack with a fresh pint. "We haven't blast-chilled it yet, so it's more like soft serve consistency," she told me apologetically. Did I care? I would have taken it if it was fully liquid! (Also, since my father has this odd habit of microwaving his ice cream to make ice cream soup, this would be better for him.) It was served that night after dinner and received rave reviews from the whole family. Sweet was the long-sought taste of salted caramel, but sweeter was the way we got it.